Systems & files copy mode supports Windows (FAT16/32/64, NTFS),Linux (ext2/ext3/ext4), Mac (HFS, HFS+, HFSX). Cable free connection for easier HDD insertion & removal. We guarantee the highest productivity without speed degradation even as the number of targets increase. The IT series SATA HDD duplicator provides four copy modes: quick smart copy, all partitions copy, percentage copy and whole HDD copy that all meet different duplication task requirements. The quick copy mode copies data and skips blank area. NTFS, Linux (Ext2/Ext3/Ext4), FAT (16/32/64), and Mac (HFS, HFS+, HFSX) formats are all supported with quick copy mode. 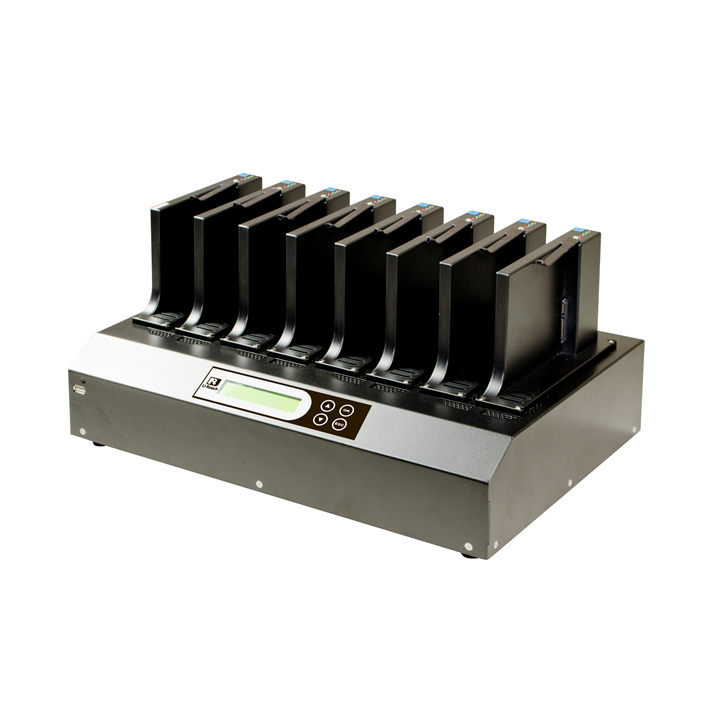 U-Reach SATA HDD duplicator is capable of copying at 18 GB/m on all HDDs simultaneously, without any speed degradation as number of targets increase. This duplicator is great for manufacturers. This mode identifies HDD Windows (FAT16/32/64, NTFS), Linux(ext2/ext3/ext4), Mac(HFS, HFS+, HFSX) formats. It will only copy the data and system contained area, which enhances the copying efficiency. This mode supports the HDD formats FAT16/32, NTFS, and Linux(EXT2/EXT3/EXT4). It will only copy the data and system contained area which greatly enhances the copying efficiency. Supports IDE, mSATA, Micro SATA, M.2 (NGFF), and CFast Card (requires adaptors). It is absolutely perfect for MONITORING the work progress during operation. It shows all the information for EVERY PORT, which is a powerful tool for sorting out the lagging writing HDD and keeping the operation efficient. All the information you need will be shown on a PC screen. 1. It’s able to monitor HDD Duplicator with duplication status from PC while duplicators are connected to it. 3.Slow R/W speed HDD detection: lagging HDD can be easily sorted, because user can see the duplication speed of every port by “Event Log”. Simplifying operation and user friendly , operating on four buttons of duplicator would complete all the jobs. 18GB/min. (300MB/sec.) *Actual performance is dependent on HDD transfer rates. Copy Modes: All Partitions/Whole HDD/Percentage copies all types of formats, both known, and unknown. Quick Copy: FAT16/32/64, Windows (NTFS), Mac (HFS/HFS+/HFSX), and Linux (Ext2/3/4). Supports MBR, GPT, and Advanced formats.